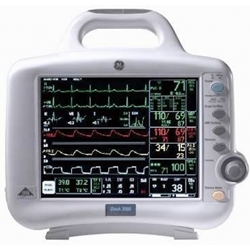 This patient monitor was recently removed from service in working order and comes with a 90 day warranty. It is in excellent condition with few signs of wear. There are no cracks in the bezel or frame and the display is clean with no scuffs or scratches. All parameters have been tested, monitor is ready for service. Note that batteries are not included. Batteries are available at $179 each, monitor uses 2.